It is very easy to lose the threads of history. People with the knowledge in their heads leave and retire. Memories fade. Preserving Housatonic’s history is the task of the Presidents Archive. The Presidents Archive belongs to Housatonic. It endeavors to organize and save materials relative to the college, both those from the past and those current materials which will be tomorrow’s past. Materials are accessible for research or other use. 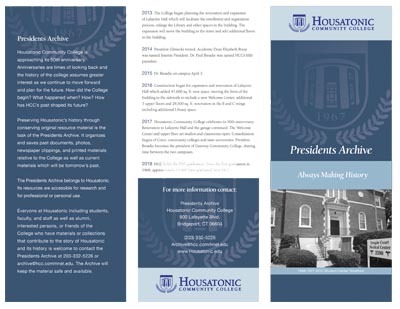 We welcome anyone at Housatonic, any alumni, any interested person or friend of the college who has materials that would contribute to the story of Housatonic and its history to please contact the Presidents Archive at 203-332-5226 or . The Archive will keep the material safe and available.